Memoirs of a Traveling Ex-Linguist: Year 14: "Blow baby... blow... harder"
When I first got a glimpse of the University at Buffalo's campus, I saw something peculiar, something eccentric, something unusual. I noticed that the trees were all pointing at one direction. Could it be the sun? No, the sun goes to different places, and besides, with the change of the seasons, the location of the sun in the sky changes all the time. At least the trees would point up because of that. But there was something else. Something unusual that I thought was really bugging me. So I set in on my mind to discover in one way or the other why the trees, all the trees, were pointing at one direction. Then today happened. The wind was exeptionally strong today. I could hear it near the windows. I could see people in their sweaters. I could see someone panic because the wind scattered her papers all over the pavement. Then I could see the trees. The trees were bent, and they were bent in one direction. 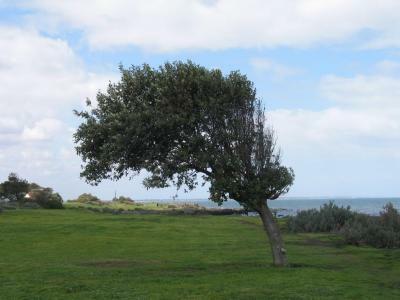 It was the wind after all, blowing really hard forcing these trees to bend and follow the direction of the wind. Good thing that their trunks and branches are flexible and bend with the direction of the wind, or else they would break. I'm tired, and nothingmuch happened today that is blogworthy. Tomorrow might be different though. I am not looking forward for tomorrow. Tomorrow is the day when my students will pass their homework and I have to read every submission and grade them. And there are 96 students in the class. I better take my rest for now. So I can recharge and face tomorrow energized again. Like that battery bunny. Wow, that is crazy! I can't believe the wind has done that to the trees. Sounds like you have a lot of work ahead! I can't believe that you have such a strong wind in your campus - that's like at the top of high mountains! Just goes to show that Air as an element is not to be underestimated in it's influence on daily life. Wow... that is nuts. I haven't seen it blow that hard, but I have seen many broken trees have storms. Make sure to batten down the hatches so you don't blow away. :o) We would miss you! Good luck resting then grading all those papers.